What is the terapy like? The body structure can be influenced by various factors throughout our life. It is not only the genetic information, but also lifestyle and movement habits, including one’s specific body posture that affect the structure of our body. Traumatic events such as accidents, physical or emotional stress form another important external factor. The fascial network reacts to all these factors by adapting the structure of the fibers. Those parts of the fascial network that under the influence of the above mentioned factors go stiff block certain movements. Subsequently the body creates a new compensational movement tendency, that in an interaction with gravity modifies the overall body posture, its shape and its function. Through the technique of touch based manipulation of the fascial network ROLFING® relaxes these body parts and helps the body find a more efficient balance in interaction with gravity. 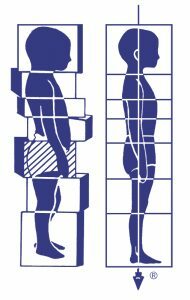 On of the main ideas of ROLFING is that the position of the skeletal system is defined by the length and tension of muscles and the fascial tissue that is attached to it. It is like a tent for camping. The tent is not held by the poles, but the tent’s ropes, or rather their tension is what makes the tent stand still and not collapse. It is the same in our body structure. The curvature of the spine, the position of the pelvis or the head and the shape of the foot’s arch are defined by the muscle tension and by the fascia that are connected to the bones. ROLFER™ is a therapist who is educated in identifying and changing the relations between muscles, fascial tissue and the bone system. By a slow pressure of the hands and a suave movement of the client’s muscles the ROLFER helps reducing the adherence of adjacent muscle parts. This way a ROLFER reduces their tension and gives the body the possibility to change compensational movement tendencies. The therapy process leads to a new arrangement of the client’s body structure and enables permanent changes in the organism. The result is not only the elimination of painful body symptoms but also an overall improvement of the client’s health.